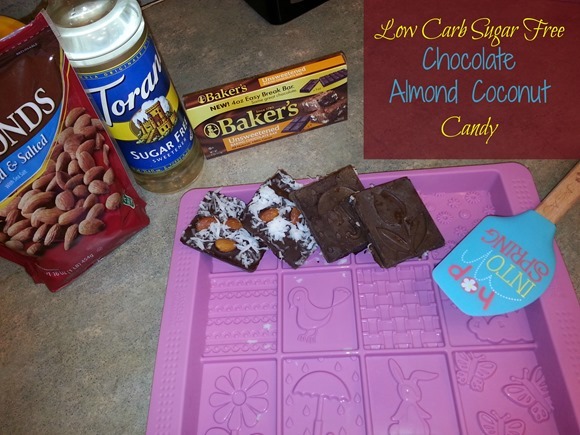 You are here: Home / Recipes / Low Carb Sugar Free Chocolate, Almond, And Coconut Candy! I am so happy I was able to come up with this Low Carb Sugar Free Chocolate, Almond, And Coconut Candy. I told you last week about my weight loss and I know many times we yo-yo up and down with our weight. So, the weight loss is one thing, but the keeping it off is quite another. I was happy to find a dessert I can make quickly and easily and I can enjoy! It has almost no carbs or sugar and tastes great! This was so quick and easy and I LOVE, of course, that it is practically carb and sugar free! Each square has less than 1 carb and less than 1 gram of sugar! Melt butter and chocolate in bowl in microwave, stir every 30 seconds until melted. Once melted, add in vanilla and Torani syrup, mix well. Pour mixture into mold spreading evenly Add almonds, sprinkle coconut on top. Place in freezer until frozen (about an hour or two). Keep in fridge or freezer until ready to serve, as they do begin to melt when left out. So excited about low carb! I’m 18 weeks pregnant and worried I might get gestational diabetes again. This really helps with my sweet tooth! So how many carbs does this actually have in it? Each square has less than 1 carb and less than 1 gram of sugar! Re: the coconut, are you referring to unsweetened shredded coconut? Would you happen to know of a sugar-free syrup that DOESN’T use Splenda? Not a healthy sugar sub. Most lchf’s use Swereve or ZSweet. DH would love this-we have Lily’s Chocolate every day for our chocolate fix. Thks for posting recipe! Yes on the coconut. I don’t know off hand of a sugar free syrup other than the one mentioned. You could try liquid Xylitol. I use granulated Xylitol in my coffee and it works great.